If the name sounds familiar with this act, it’s likely you’ve heard one of their remixes for big artists like Bruno Mars and Capital Cities. The production and dance-pop trio based out of Roseland, NJ has been picking up steam lately and I’m sure its members, brothers Alex and Jean Paul Makhlouf and friend Samuel Frisch, are very happy with the results. Their latest effort, a new single “Home”, premiered online earlier this summer and features New York City singer and songwriter Bebe Rexha doing the lead vocal. She and the band recently shot a music video for the song, which should be out later this month. The last time the trio released a radio single was in the spring of 2009 when “Party In Your Bedroom” received some limited airplay on the CHR panel, which at the time was being promoted by the defunct Universal Republic Records, now just Republic. It picked up a total of eight radio stations in mostly small and medium markets. I also playlisted it below my chart for twelve weeks beginning in early March, though it never made it into my personal top 40. At a time when similar acts like 3OH!3 and Cobra Starship were dominating pop radio, “Party” never stood a chance of becoming a hit simply because that genre’s presence on the format was already overwhelming. However, with a more straightforward electronic sound, simple lyric and six radio adds in the last week, the future is looking bright. Time to get a hit. Here’s the group based out of Los Angeles, CA whose Twitter account dubs them as “America’s Boyband” as they face popular imports like One Direction and The Wanted. Granted, there are quite a few American boy bands still active: Backstreet Boys, Big Time Rush… even O-Town‘s making a comeback. However, I think these guys will be just fine. 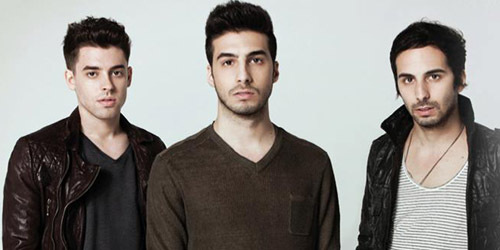 The band consists of twenty-somethings Anthony Ladao, Colton Rudloff, Eric Secharia, Joey Diggs and Thomas Augusto. I remember voting for Rudloff (in the solid blue button-down above) in an online competition a few years ago on the word of an online friend who was friends in real life with him. Though they formed back in 2009 under a different name and with a different label backing them, it’s only just now that they seem to getting a notable push with their first release under Capitol Records and sub-label 2101, owned by producer RedOne. “Home” picked up a few adds throughout the summer but wasn’t actively promoted to radio until about three weeks ago. That total is now at 32 stations, including big markets like Chicago and New York City. After a going on a large summer radio tour, it appears things are falling into place with their wholesome image and catchy pop song with a fun beat. Now, the five boys have to really take it home. With a huge social media following at over 400,000 users, they’ve got a lot of company to keep them on the right track back. They’re two hot bands looking for the path of pop to the headquarters of hits this fall — which one will be knocking on the door first? Comment below and let me know what you think or find PGTC on social media by clicking the “Get Social!” tab.